The rumor: Images of an alleged "iPad Pro" rear shell land on Chinese website Weibo, adding to speculation that Apple is prepping a 12.9-inch slate. The verdict: There's no way the Weibo image is a genuine Apple product. At best it's a dummy part based on assumed specs; at worst it's just a Photoshop job. 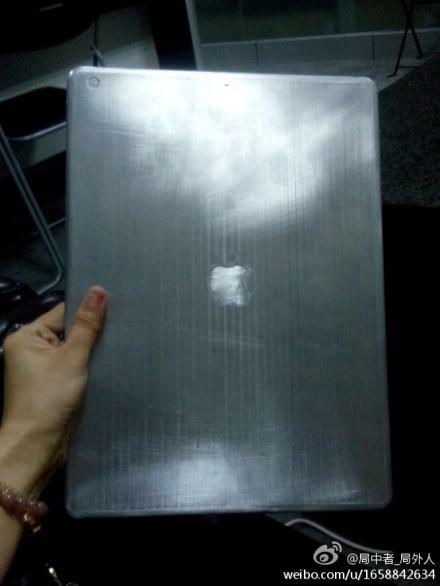 A metallic back for what appears to be a larger ‘iPad Pro’ has been posted on the Chinese forum Weibo. The part looks to be for an unreleased 12.9-inch model, and the same person has also shared images of an iPhone 6 dummy that matches previous leaks. 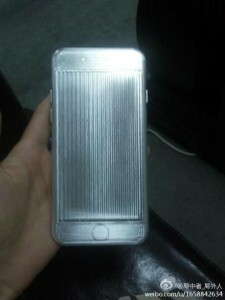 An iPhone 6 casing from the same leaker. The leaked iPad Pro dummy gives little to no context, which makes verifying any level of authenticity difficult. The Apple logo is there as well as the typical camera hole, but that’s all there is to go on. Parts like this could be easily faked, so we’re not giving a lot of credence to an iPad of this size until more stuff is leaked. It was rumored at the beginning of the year that a 12.9-inch iPad Pro was in the works for as soon as a fall release. The device could even feature a 2K display and eye-tracking technology, although those details are far from concrete. The Wall Street Journal reported that Apple was prototyping larger iPads last summer. More recently, Digitimes said that Apple was facing “development hurdles” with the iPad Pro, and that it had temporarily “shelved its large-size tablet project.” Reputable analyst Ming-Chi Kuo has said that a 12.9-inch iPad is in the works, but not to expect it from Apple this year.